NETWORK FINALS: CBS’s NCAA TOURNAMENT coverage adjusted to 1.9. 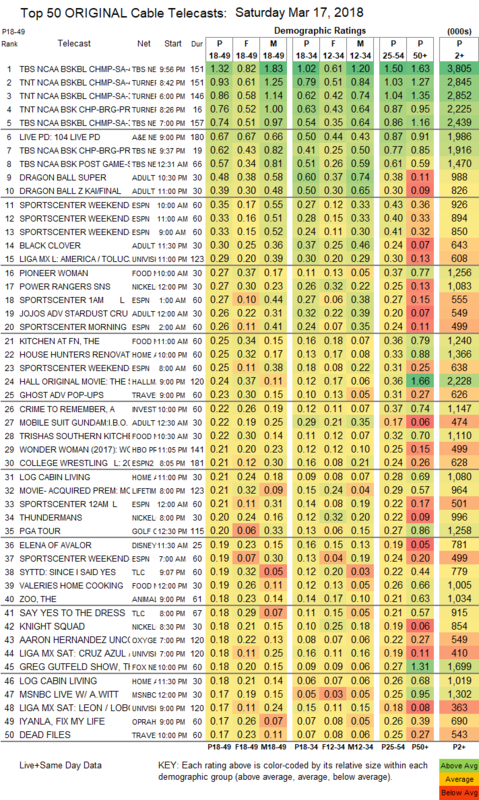 Elsewhere,DATELINE lost 0.2 in final numbers, and the SUPERSTORE and DECEPTION reruns were down 0.1. CABLE HIGHLIGHTS: Cable’s NCAA TOURNAMENT coverage again blanketed most of Saturday’s Top 8, led by TBS’s primetime Houston vs. Michigan game at 1.32. A&E’s LIVE PD again interrupted the streak, up a tick to 0.67. The Adult Swim line-up performed as follows: DRAGON BALL at 0.48/0.39 compared to last week’s 0.55/0.45, BLACK CLOVER down 0.03 to 0.30, JOJO’S BIZARRE ADVENTURE down 0.05 to 0.26, MOBILE SUIT GUNDAM down 0.05 to 0.22, HUNTER X HUNTER down 0.03 to 0.21/468K, NARUTO down 0.01 to 0.22/488K, OUTLAW STAR up 0.02 to 0.23/460K, SPACE DANDY up 0.01 to 0.22/438K, COWBOY BEBOP down 0.01 to 0.19/386K, and GHOST IN THE SHELL down 0.04 to 0.15/317K. 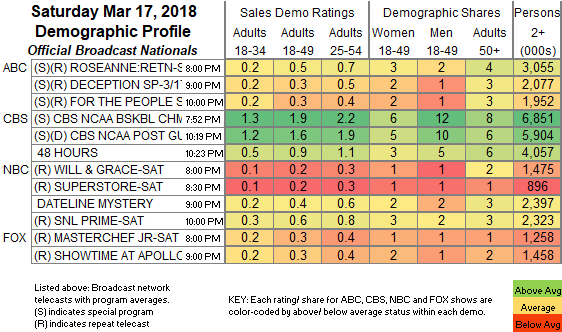 Food Network’s DINERS, DRIVE-INS & DIVES was at 0.31/0.26/0.22, PIONEER WOMAN jumped 0.13 to 0.27, KITCHEN AT FN ticked up to 0.25, TRISHA’S SOUTHERN KITCHEN ticked down to 0.22, and VALERIE’S HOME COOKING was at 0.19. Univision’s LIGA soccer match was at 0.29. Nickelodeon’s noon POWER RANGERS dipped 0.02 to 0.27. HGTV’s HOUSE HUNTERS RENOVATION dropped 0.05 to 0.25. Hallmark’s movie THE SWEETEST HEART was at 0.24. ID’s A CRIME TO REMEMBER was at 0.22. On We, SAY YES TO THE DRESS fell 0.05 to 0.18, the follow-up hour was steady at 0.19, and HEAR ME, LOVE ME, SEE ME was down 0.03 to 0.12. On OWN, IYANLA FIX MY LIFE was at 0.17 compared to last week’s 0.15/0.14.